There's a lot of talk about "ROI" or "return on investment" in my office (I work with some data geeks.) Although statistics generally make my eyes cross, I do know this - if you want a good ROI in your garden, you really can't go wrong with garlic. It's cheap, easy to grow, and produces a bumper crop that will keep you in fresh, flavorful cloves for several months or longer, depending on how many plants you grow. My husband (the sous-chef) and I have planted garlic three or four times and always enjoy both the growing and the eating of it. In addition to the culinary and aesthetic delights, you'll also be helping to slow global warming because growing your own food helps shrink your carbon footprint (if you're curious about your carbon footprint, click here to calculate it.) Plus, you'll be sparing yourself, your family, and the planet a buttload of toxic insecticides and industrial fertilizers. It's hard to get much "greener" than that! 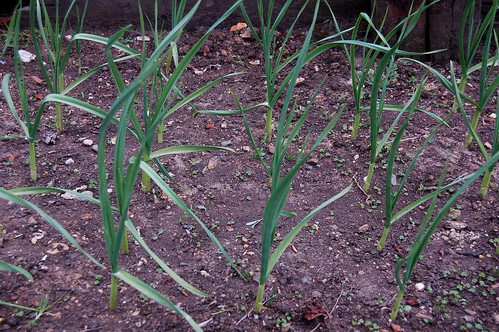 Although you can plant garlic in the late fall (more on that below), now is also a great time to sow your garlic crop. Below you'll find all the info you need to get started. 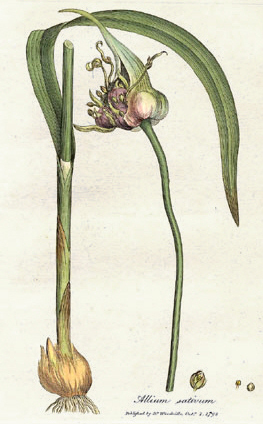 There are two basic types of garlic - hardneck and softneck. Hardneck varieties grow tend to do best in northern zones and produce a curling flower which is called a scape (see the photo below). In addition to being beautiful (isn't the curling stem awesome?! ), the scapes are also very tasty eating. You can steam them and eat them with butter or throw them into a stiry fry, etc. 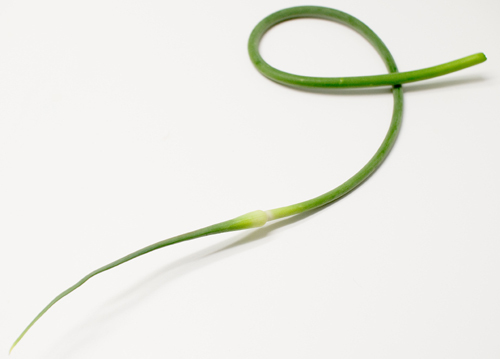 Most people cut the scapes in order to encourage the plant to put all its energy into the head. You should wait until the scape has made one or two loops, then snip it off. Softneck varieties are also known as braiding varieties because they do not produce a scape and are therefore easier to braid than the stiffnecked kind. They're also better adapted to warmer climates, a bit more productive, a little spicier, and can be stored longer than the hardneck garlics. Garlic can either be planted in late fall or early spring. Basically, if you live in an area with a shorter growing season and/or poorer growing conditions, plant your garlic in the late fall to give it more time to establish itself. I've planted it in late October with good results but I've also gotten good results from an early spring planting. All you lucky bastards who live in warm climates should note that if you want to plant a hardneck variety, you may need to cool it down before planting. Hardnecks often need a cold snap to trigger sprouting but you can fake one by storing the head in a cool (45-50 degrees F), dry place for about three weeks prior to planting. Garlic likes plenty of sun so look for a spot that will make it happy. The plants do best in sandy loam with good drainage and lots of organic matter. If your soil is poor, you should add some organic compost material to build it up before planting. You can also grow garlic plants very happily in containers, provided that they are deep enough and offer good drainage. 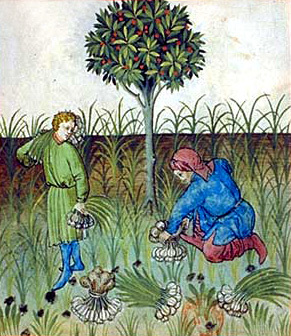 Each clove will produce one head of garlic by the end of the season. 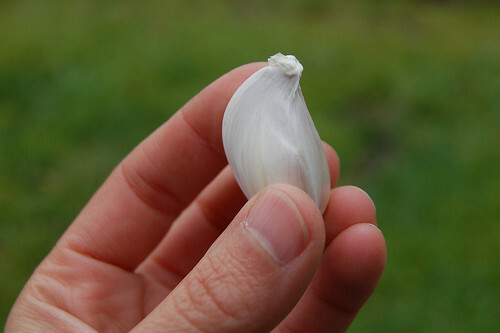 You'll want to use good-sized cloves because a bigger clove = a bigger plant = a bigger head of garlic at harvest time. You can plant the smaller cloves but you may want to harvest them early as scapes or garlic greens since they won't yield a very large head of garlic at the end of the season. 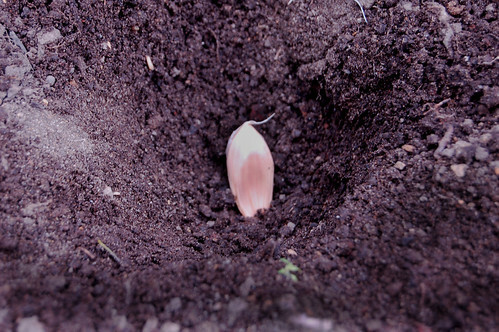 When you are ready to plant, break the cloves apart, making sure to remove all of that hard "basal plate" they're attached to from the bottom of each one so that it won't block the new roots from growing. Then, plant each clove tip up, about 1 inch deep and 4 inches apart. If you're planting several rows, space them far enough apart to walk between them. Cover the cloves with soil and then water them. Garlic plants like even moisture so you should water them regularly. However, it's important not to overwater or the bulb can rot. Here is a photo of our little garlic patch, planted about one month ago - the shoots came up within a week or so in northern California's mild climate. As your garlic plants reach maturity, the leaves will turn brown, then dry up and die. Don't freak out - this is normal. Just keep an eye out for this change so that you'll know when they're getting ready to be harvested. When you notice the leaves dying, you should stop watering the garlic plants and give them a few weeks water-free to dry out and harden before you harvest them. If you're not 100% sure whether your plants are ready to harvest, just dig the dirt away from one of the plants and take a look at the bulb - if it looks ready, go for it! Fresh garlic bruises easily so you should treat it gently when it's first picked. It's important to dry garlic properly to prevent it from rotting. If you have the space, it's ideal to hang up the dirty bulbs (don't wash them) in a cool, dry place to cure. After a week or so, you can take them down and gently brush the dirt off them. You can also remove the outer layer of skin from each head to make them look prettier if you like. If you've grown a softneck variety, you should be able to braid your garlic. Most of the resources I've read about braiding suggest curing the garlic for at least a few days before you braid it to allow it some time to dry in the hopes of preventing mold. Once your garlic has cured, start with three heads of garlic (with the stems still attached, obviously)and beging to braid them as you would anything else, adding in additional plants as you go. For more detailed instructions, check out this excellent write up with photos from Bloomingfield farms. If you somehow end up with more garlic than you can possibly use, give some away - I promise that your friends and family will be thrilled! Thanks for the excellent tutorial! I think I can even do it, and I'm gardening challenged. Last year we got garlic scapes from our CSA and it took me weeks to figure out what they were. But once I did--wow! I made pesto with them (scapes, asiago cheese, and olive oil in the food processor). Some of the best stuff I've ever eaten and it made heavenly bread too. This year I will take as many scapes as she will give me, and we'll try to leave enough pesto to freeze. What a great idea! that sounds totally delicious. Just check out your reflections blog and see that we are reading (or planning to read) a lot of the same books! as usual, i am impressed and inspired. i will keep you posted on my success. awesome... I am definitely going to try this! Excellent ! I was lucky enough to be given some organic home-grown bulbs for planting. They've been in the fridge for a few weeks and now I know exactly what to do with them. June in Oz should be OK for planting I guess. Excellent article--thank you. For anyone wanting to "dip a toe" in the garlic growing water, a cheap way to try it out is to just buy organic garlic and plant that. You can get it at a grocery store, or even better, a farmers market. I spent the bucks on fancy mail order garlic, and then later got some trader joes organic, and it came up with just as much vigor. inspired by this post, I planted my first patch of garlic in my Brooklyn garden this spring. they were the first plants to sprout! can't wait for the harvest. A Baby Bib That Looks Good Enough to Eat! Greening Your Kitchen: Buy In Bulk!